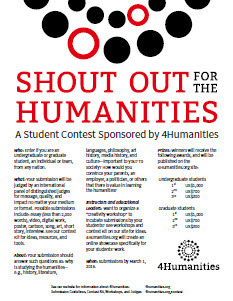 4Humanities.org announces its Shout Out For the Humanities student prize contest. Prizes are offered for best undergraduate (1st prize: US $1,000 – 2nd: $700 – 3rd: $300) and best graduate student (1st prize: US $1,000 – 2nd: $700 – 3rd: $300) submissions by students from any nation, working individually or in teams, that speak up for the value of the humanities in today’s society. 4Humanities wants to showcase student ideas and voices on such questions as: * Why is studying the humanities–e.g., history, literature, languages, philosophy, art history, media history, and culture–important to you? * To society? * How would you convince your parents, an employer, a politician, or others that there is value in learning the humanities? Submissions will be judged by an international panel of distinguished judges for message, quality, and impact no matter the medium or format. Possible submissions include: essay (less than 2,000 words), video, digital work, poster, cartoon, song, art, short story, interview. (See Contest Kit for ideas, resources, and tools.) Submissions are due March 1, 2016. Students may enter the contest as individuals or teams if they are currently enrolled in an institution of higher education or graduated no more than two years beyond the contest submission deadline. Prize winners will and their submissions will be featured on the 4Humanities site; and 4Humanities will also showcase many other student submissions.